For doggy basketball, you need a basket and a ball. The baskets made for little kids are about the right height. You can probably ﬁnd one at a garage sale. For a ball anything will do, from a tennis ball to a mini- basketball. Your dog should be able to hold on to it easily, but it should not be so small that she can accidentally swallow it. First, get your dog familiar with the basket—especially the rim. Click and treat if she sniffs at or touches any part of the basket. When she’s doing that consistently, wait until she touches just the rim before you click and treat. Repeat that several times. This may take a few days of practice. Next, teach your dog to put her head into the basket, or “dunk.” Initially you will need to click if her nose drops even alittle way inside the rim. Gradually work her up to putting her whole head through. If your dog has a large head, just the nose will do—you wouldn’t want her to get stuck! Add a verbal cue, such as “dunk” or “slam dunk.” Never, ever push your dog’s head into the basket. If she never wants to do this trick, let it go andpick another one. No matter what, your dog is your best friend. No trick is worth hurting or scaring your dog. Once your dog is doing the motions of the dunk, you can add the ball to the mix. First, teach her to hold and fetch the ball without the basket nearby . If your dog either doesn’t like balls or goes nuts over them, this may take a while. Be patient, and don’t try to move on until she has mastered the hold and fetch with the ball. Taking the ball and ﬂinging it at you doesn’t count! Next, bring out the basket. This is where it gets tricky. 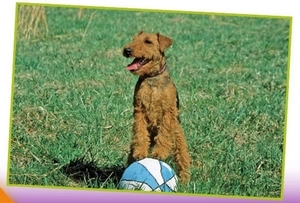 Give your dog the ball, tell her to hold it, and then give her your “dunk” cue. She probably won’t put all the pieces together at ﬁrst, because this is a complicated trick. But it’s worth a try. If your dog doesn’t get it, stand near the basket and have her bring the ball to you. Repeat a couple times. Next, have your hand right over the basket when she brings the ball to you. Repeat several times. Your next step is to hold your hand beneath the basket so your dog drops the ball through the basket and into your hand. Give your “dunk” cue before she drops the ball each time, and click and treat when she does it. Repeat several times, and then gradually start moving your hand out from under the basket. Eventually she will drop the ball through the rim without your hand anywhere nearby.